Welcome to the GALIBIER-THABOR skiing area !! 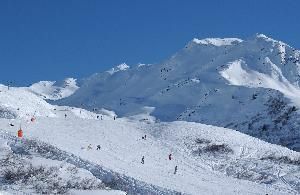 Named after the two mountains 'Grand Galibier' at 3228m and the 'Mont Thabor' at 3178m which dominate the two resorts of VALMEINIER and VALLOIRE and offers 150km of skiing on 4 mountain sides. 70% of the skiing area is situated higher than 2000m altitude to guarantee you exceptional snow from December to April. 400 artificial snow cannons have been stratigically placed to maintain the same snow level throughout the skiing area. 87 slopes of all levels, situated on the Gros Crey, Crey du Quart and Sétaz mountains. Easy access to the skiing area from the village at 1500m altitude or the resort at 1800m, climbing as high as 2600m altitude. 70% of the skiing area is above 2000m. 5th largest snowpark in France: halfpipe, medium, expert and ski-cross, Val kid slope. 2 competition slopes FIS approved.